So you are in need of a Cinnaminson porta potty rental for your location. You are a contractor, or an event coordinator with big needs, or perhaps you are a homeowner who needs just one porta potty for an occasion? No problem. Just call us for the lowest porta potty rental rate around. Being local to South Jersey, we have quick turnarounds for not only porta potty rentals, but also South Jersey dumpster rentals should you need one or more. Whether the porta potty is for a company, an organization or if you are a homeowner, we’re ready to drop off to and pick up from your Cinnaminson spot. We are here to help you with your Cinnaminson porta potty rental. Our porta potty price quotes are always provided hassle-free and over the phone. Your telephone call will bring you to one of our friendly porta potty team members, and they will help you to rent your porta potty. Just let them know how you intend to use the porta potty and how many people will be on the Cinnaminson location. We will guide you the rest of the way to make sure you rent precisely what you need. Cinnaminson Porta Potty Rentals and Wash Stations Too! Your Cinnaminson porta potty rental can be provided with a variety of options. Robinson Waste can rent porta potties in blue or pink. Choose from standard porta potty rentals to flushable VIP porta potty units, and even wheelchair ADA accessible porta potty rental units. Call Robinson Waste today and let us know when you need your porta potty dropped off. From your first phone call until the return pick up of your Cinnaminson porta potty rental, you will always receive the attentive porta potty rental customer service all Robinson Waste customers can county on. 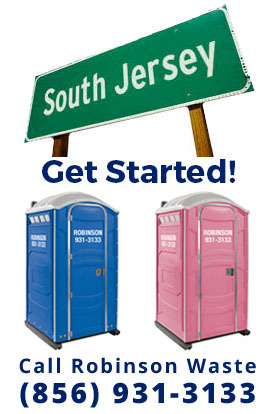 We provide porta potty rental deliveries for the Cinnaminson area and have a well-stocked inventory. Our porta potty dispatch teams are ready to deliver clean toilets to you in Cinnaminson. We rent the most dependable and affordable porta potty rentals in Cinnaminson. We also provide bathroom trailers for rent in many other South Jersey / Philadelphia area towns and neighborhoods. Do you need help to rent a Cinnaminson porta potty, be it a standard porta potty or wheel chair accessible porta potty? Call us for porta potty rental advice and for prompt rate quotes for renting porta potties in Cinnaminson NJ. Our staff will make your porta potty rental hassle-free. We are available to answer your questions, so please call us today.